Ecocentrism has become a driving force in Hollywood. As a Christ-follower, I agree with this trend. The Day After Tommorrow (starring Dennis Quaid and Jake Gyllenhaal) helped energize Hollywood's environmental awareness with it's daring, high-definition portrayal of what might happen if we keep using fossil fuels as our primary source of energy. The movie boasts of a generous budget and big actors as any blockbusters should, yet it stands out for it's frighteningly vivid portrayal of our future as an excessively consumptive society. The movie makes a statement about the environment that appeals to both our moral and pragmatic senses. More recently, Wall-E, Hell Boy 2 and The Happening have come along to portray a similar message. -- We should use the brains God gave us. I wouldn't pump car exhaust into my house, so why would I pump exhaust into the air outside my house? Doesn't the air inside my house come from outside? -- One of the most basic things that Jesus teaches His followers is to care. We all live within the confines of the Earth's environment. If Christ's Second Coming does not occur during our lifetime the way it didn't during our parents' lifetime, then our children will have to breath the same air and drink the same water that we are polluting right now. -- We should express our appreciation for the air we breathe and every other good thing God gives us by taking care of these things. This means not only polluting less, but also consuming less. Environmental trends demonstrate that, rather than humbly eating our fill, we tend to gorge ourselves with whatever resources we get our hands on. This is both physically and spiritually imprudent. We would honor God better by humbly embracing whatever good things He provides, concentrating more on our neighbor's needs than our right to hoard and consume. As Christians, taking care of the environment is not our main purpose for existing, but it should be a fruit of our main purpose for existing. There are some who acknowledge that God has been generous, who then use this truth to justify their excessive consumption, but this is an inappropriate reaction to God's generosity. the given rights to all the men? Although these lyrics are sarcastic, this is how a lot of people actually thing... consuming whatever they want regardless of their children, or the next generation. 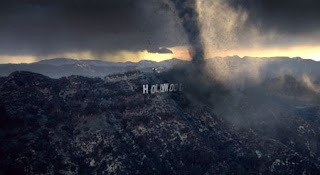 Tragically, many church-goers adopt an excessively consumptive lifestyle and then justify their actions with the statement from 2nd Peter chapter 3, "But the day of the Lord will come like a thief, in which the heavens will pass away with a roar and the elements will be destroyed with intense heat, and the earth and its works will be burned up." However this is in appropriate... the above statement is a not an argument for consumption, but for holiness, as the next verse clarifies: "Since everything will be destroyed in this way, what kind of people ought you to be? You ought to live holy and godly lives..."
If we know Jesus at all, we will endeavor to look out for others, excelling in every way, to the best of our abilities. Taking care of the environment is included in this. In any case, consuming more does not equal living more. And having more does not equal living more. Good post, though WALL-E is not about the environment. It's about egocentrism, not ecocentrism (at least, according to writer/director Andrew Stanton, who is also a professing Christian). true Wall-E's not exclusively about the environment, but the destruction of the environment is one of the movie's main moral points of reference... i.e., the environment is messed up, therefore it's obvious that we need to act differently. Thank you so much for this post. I am baffled by the Christians I know who see the green movement as something contrary to their beliefs. As Christians, aren't we supposed to be good stewards of everything God has entrusted us with, including our earthly home?